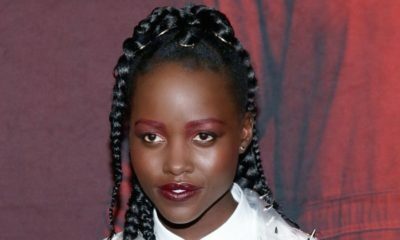 We can’t get enough of Lupita Nyong’o and so can’t Hollywood. Hollywood’s New It Girl is the face of Miu Miu, covered a good number of magazines and is racking up Oscar buzz for her role in 12 Years a Slave. The Kenyan actress was a guest on Jimmy Kimmel Live. She dished on getting her role, meeting Leonardo DiCaprio, and being more popular than her father who is a senator in Kenya. thats all well and good, but this http://en.wikipedia.org/wiki/Isis_Nyong%27o is her cousin. 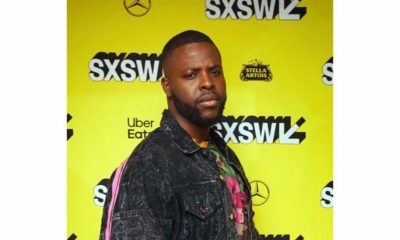 Isis Nyong “…led MTV Network’s commercial entry into Africa as a founding member of that team.” How’s that for small connects? I’m not hating tho, I think Lupita is an EXTREMLEY talented and beautiful actress, but information is always good. I’m sure people in the audience where going O she speaks so well for an African!!! So. Africans don’t speak well? Was thinking that myself and glad when she clarified that she visited the US for the first time in 1999 (by which year she’s have been a 16 year old with foundational education gotten from Kenya). It continues to irk me when I hear that, “Your English is really good, when did you come to the UK?” question. My English is good because I had a great education in Nigeria, shikena. Stop looking for other reasons to explain it. 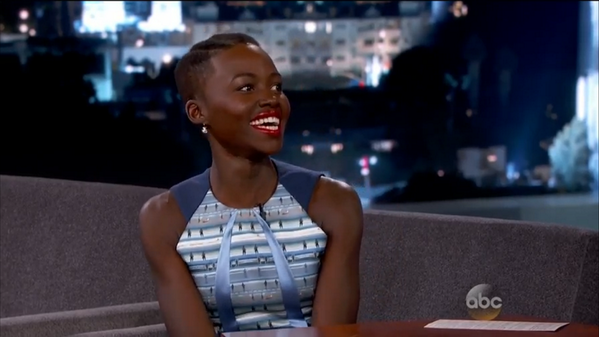 That said, Lupita’s interview was a delight to watch. Nice. Love her to bits. when God says its your time, its your time, no one can dispute that. shine on lupita! Aaaaww she’s interesting and loveable!! She is beautiful too!!! Love that we are now appreciating different representations of beauty!! BN and i have one thing in common….we just cant get enough of LUPITA!!!! !….Go girl!!! Genny I hope u are watching! Yep! She and our numerous Naija Nollywood and music artiste! Learn to seek knowledge my naija “celebs”. Me loving some Lupita at the moment. She represenets Africa well, especially Kenya. So Genny, over to you, please on your next opportuned interview, rep Naija well O!, But first you need to seek knowledge. Thank you. she’s soo beautiful and and interesting. i just hope our girls will now realise that being black has always been beautiful(not only in skin but in brains & character)..Not all these whitening skins changing syndrome…. This girl has truly got IT! Shine on trail blazer! Wow.. she is so comfortable and confident in her skin.. her responses were so good and candid.. I also watched her interview with Oprah and co and she is definitely very well spoken. Well done Lupita. I am learning from you.. Godbless from your Naija fan!. I’ve seen neither Shuga Kenya nor 12 years a slave so I’d been privately wondering what the hype was all about but watching this, I’m loving this lady with the way she speaks and her sense of humour. She comes across as intelligent and she was quite relaxed during the interview. Hardwork and self improvement! She had a goal and worked towards it, eloquence confidence and of cos talent. If only our Naija thespians can see this! Its not to buy all the channel bags or globe trott, you can. Only get international attention by upping your gaame, else. Will continue to bea nollywood actor shooting funny movies in the US andtelling your self you have reached the peak of your career! Ahh, so maybe it’s time for our Genny to go to Yale of UCLA for her Masters oh!!! Seems that’s a good way to get in and get noticed oh!!!!!!! Go Lupita!!!!!!!!!!!! i’m jumping on my couch right now. she is simply amazing! Beautiful Interview!! Well done Lupita. Lupita is a true star. i love everything our her. 1. NO bleaching of skin- She is all African and proud of her beautiful skin she was born with. Dencia and her followers take note. 2. No forming of accent : listen to her accent , so clean and proper, you can tell she is African even if she has been to american and mexico. Toke and her followers take note. 3. 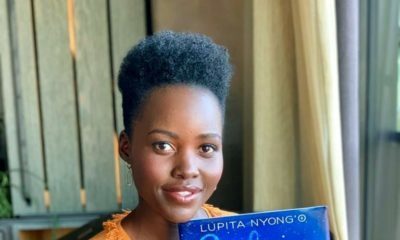 NO showing off her huge success – Lupita has the right to show off if she wants because of her nomination for an award, but this African hardworking beauty reminds to stay very very humble. imagine, you wont see such character showing off her shopping bags. Chike Ike and her followers take note. 4. No act of bitchiness and pride in the mist of fame – Lupita is so composed in this interview and all other interviews and the famous people she has been with, which is bringing her loyal fans from all over the world because of how humble she is and well behaved. not being famous and boastful the next second. Muna and her followers take note. 5. No father’s name attached to her success – Lupita hard work paid off, am very proud of this girl. She went to school, started from small roles, auditioned for a big screen role, and look; she is the talk of town today. Am so impressed. Not those of you who use your father’s name to get to the top without doing half of your own hard work . Dj Cuppy and her followers take note. congrats Lupita. love you soooo much and cant wait to see more of you. Thank you Hannah, you said it all. Nothing to add. Our Naija celebrities, please take note. Omg I love this everything you said was totally true. I laughed when you named a celebrity as a bad example. Especially the chika ike one. Lmfao! That’s my gurrrl!! God go make you bigger o. Amen! Thank u Hannah! All they do is compete with each other on Instagram. Private jet tins, chanel bag, Louis Vuitton, snapping pics on business class lol. I tire for this our so called actors ! omg bellanaija people You guys kill me I come here everyday just to laugh! wow she’s stunning and the camera loves her! I wish alot of these Nollywood actors/actresses would study acting and become world class actors rather than frontin on instagram. Even if Nollywood actors and actresses have the best training, the problem is behind the scene crews, they have no training example; directors,editors ,dop, lighting, script writers, welfare package, lack of structure or organisation,producers ,locations, funding etc. Nollywood is a career killer, bottom line is what face can sell my movies not what Talent can sell my movies. She is amazing!! This is the first interview of her i have seen.. she is so charismatic, and natural. I love you Jennifer Lawrence, but I’m joining the Lupi train now.. I didnt know her name was Mexican either. You can love them both, both ladies are fabulous. Good girl.Nice for not letting your father’s status get to your head. Chiwetel Ejiofor is also from an upper middle class family…Father is a doctor and mom is a pharmacist. Good for her. I enjoyed her in Shuga. I have not yet seen 12YAS/Fruitvale Station/The Butler -I don’t know if I will. That said, na wa for some of una, you cannot give praise without pulling another down. There is a lot that your early years education/background plays into who you are. Lupita is an “ajebutter”, a well traveled one at that, sent to Mexico to learn Spanish, graduated from Yale, her father is a Senator- an African Senator, so she has been in circles (networking) that a lot of people do not get to roll in. So why will she not be well spoken and carry herself with confidence? As for bleaching it would be really silly for her to try that nonsense, she has beautiful dark skin and the upkeep will be hell. Hollywood is a dangerous machine, it will chew up the strongest, spit them up and keep on trucking. Everyone has their own path and place in the entertainment industry. Big fish in a small pond or a small fish in a big pond? Live and let live. Besides, Hollywood really does not see it for black acts. Bia Bev, gbafuo gi, what are u spewing?, u so pessimistic! Hollywood chews & spits pple out, nollywood kwanu?, what do they do?, keep a bunch of tanlentless actors around?. She doesnt bleach her skin cos she loves who she is & not just cos her black is beautiful!. Whether u are chocolate or charcoal black, love ur self and stop trying to be sth else.